Want to use up those Thanksgiving leftovers this year? There’s my Ultimate Thanksgiving Sandwich or simply add leftover turkey to this soup for two classics, but this new thanksgiving leftover meal takes the cake. 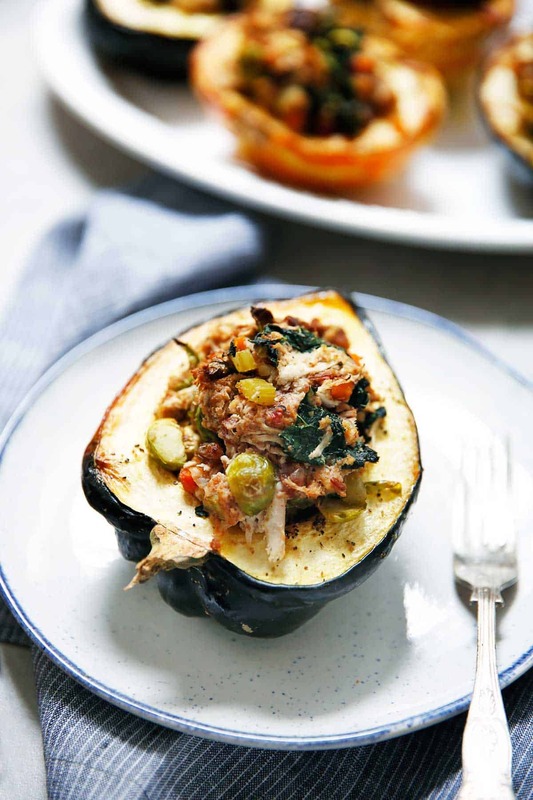 This delicious stuffed squash is loaded with cranberry relish, stuffing, turkey, and all your veggies; and it is SO good. I will be making this year after year! Made in partnership with Rubbermaid FreshWorks. I am so excited to partner with Rubbermaid to bring you this awesome Thanksgiving leftover recipe! 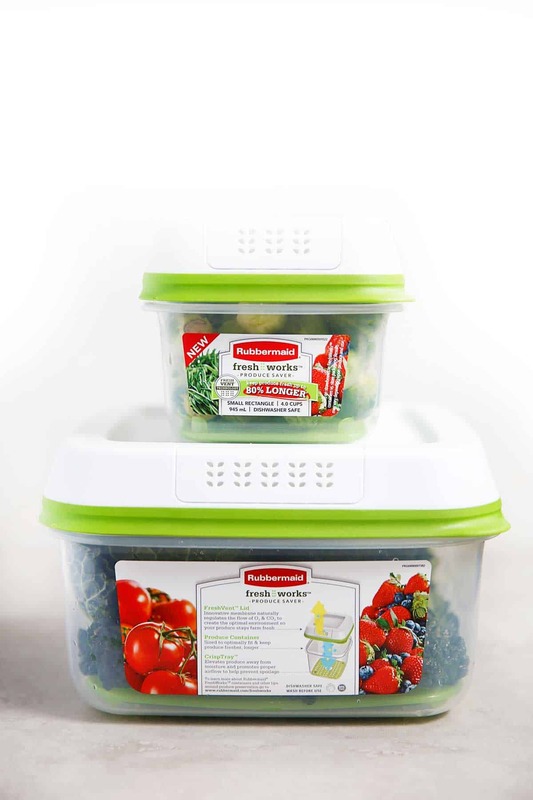 Rubbermaid FreshWorks Produce Saver containers are dishwasher safe, BPA free, and help keep produce fresh 80% longer than traditional packaging. They are perfect storage containers for everyday use to extend the life of your produce, especially when you have so many veggies, fruits, and herbs in your fridge like I do! I tested keeping my veggies in their original packaging and in the FreshWorks containers, and they are a total game changer! 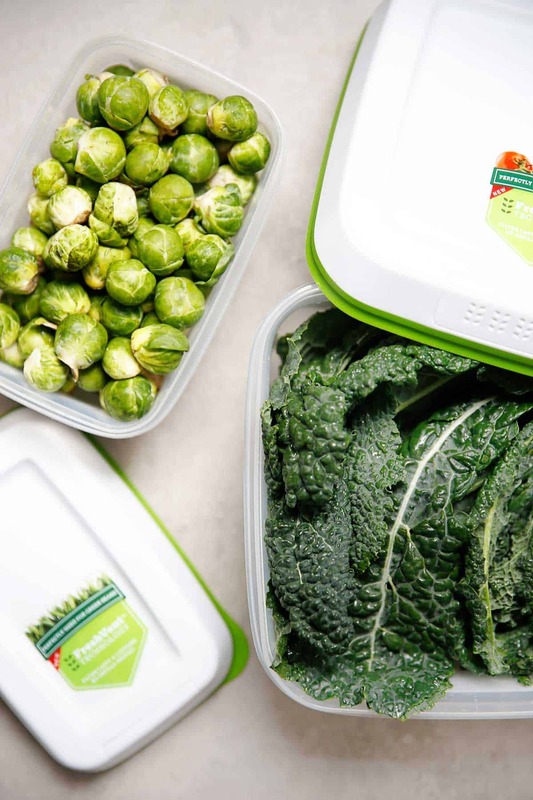 Their innovative food storage containers use patented FreshVent technology, which keeps produce fresher up to 80% longer. Simply move produce from the store packaging into the FreshWorks Produce Saver before refrigerating to help reduce moisture and spoilage! Okay, let’s first roast up the squash. Any squash will do! They make such a beautiful meal, and eliminate holiday food waste! You can totally customize them with any leftovers! 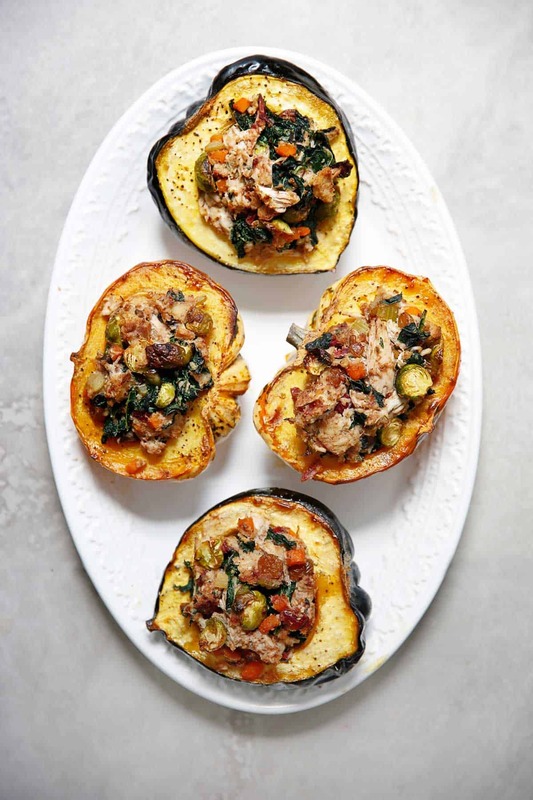 How long do you bake stuffed squash? Parbake, then place equal amounts of filling in each squash half, piling it high in center. Bake until golden brown on top, about 20 minutes. 1. Combine the melted butter, salt, pepper. Remove the seeds from the squash, and brush over the cavity of squash. 2. 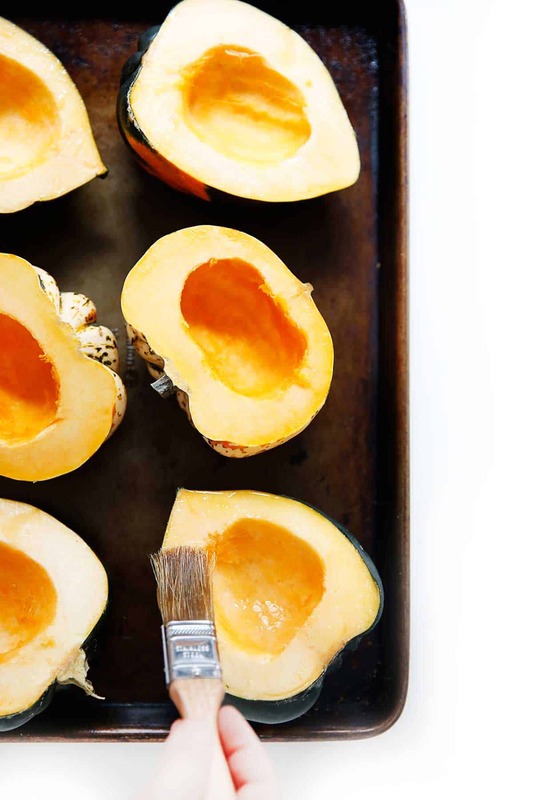 Bake in a large roasting pan, cut side up, at 400 degrees F for 45 minutes to 1 hour, until squash is tender yet still holds its shape. 3. Combine the stuffing, vegetables, cranberry relish, and turkey in a large bowl. Taste and season with sage, thyme, rosemary, salt and pepper as desired. Add in nuts if using. 5. 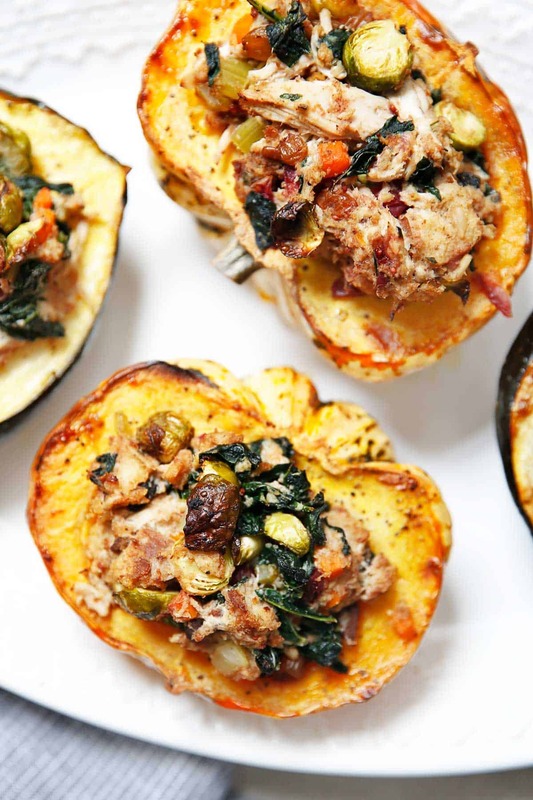 Fill the squash halves with stuffing. Fill them up a good amount and in a moulded shape. 6. Return to oven and bake, uncovered, for 10 more minutes. This post is sponsored by Rubbermaid. All thoughts and opinions are always 100% my own! I love their products and think you’ll love them too. Thank you for continuing to support LCK and the brands I work with! Love new ideas for Thanksgiving leftovers! I think I like the Thanksgiving leftovers better than the actual meal. Is that weird?!?! Lol. And I love stuffed squash. Definitely making this! OMG, I LOVE this idea! So much better than a leftover sandwich! !